To start, the user displays the default listing. The user selects Detail Listings in the left area of the Analyzer. 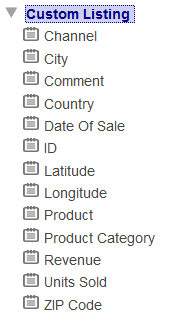 The user can then drag listing fields from this area to the Custom Listing Fields box. the system then executes the listing query and displays the results. For Enter New Item Name, type a listing name. Select the listing name in the Model Viewer, in the Listing Fields section. Display name  Localizable name of the listing field. If you do not specify this, the user interface instead displays the logical name. Description  Description of the listing field. If you do not specify an alias, you must put parentheses around the expression as shown here. Resource  Specify the resource that secures the listing field. In Field Expression, you can use SQL functions, including InterSystems SQL functions such as %EXTERNAL. When a user creates a custom listing in the Analyzer, the system creates an SQL SELECT statement that contains a comma-separated list of the Field Expression of the selected listing fields. You can specify an SQL alias within Field Expression. However, if you do so, Display name is ignored and the field name cannot be localized. You can also create a listing field via drag-and-drop action. To do so, drag a field from the left area and drop it onto the Listing Fields heading. Then select the new listing field and make any needed edits in the right-hand area. You can also drag a different source field and drop it into Field Expression. If you do so, the value there is replaced with the new field.